Amino AcidsDymatize Super Amino 6000 - 180 tabl. Dymatize Super Amino 6000 - 180 tabl. One of the strongest amino acid products available on the market. The most elementary product in any supplementation program. Excellent source of nutritious protein! 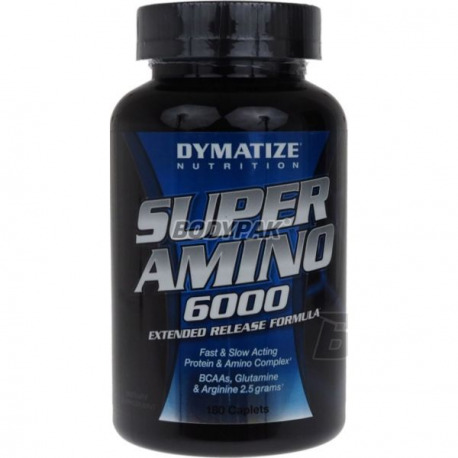 Dymatize Super Amino 6000 - 345 tabl. 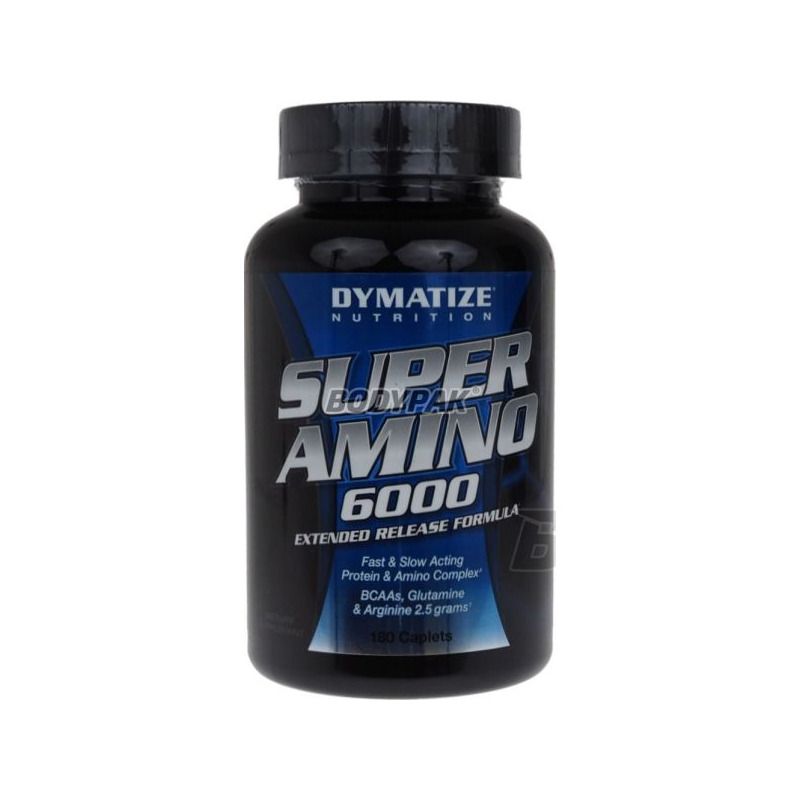 Dymatize Super Amino 6000 - 500 tabl. Dymatize - Super Amino 6000 Amino acids are the basic particles of protein building muscle structure. We divide them into essential (which must be supplied with food) and unnecessary (which can be synthesized, but at the expense of amino acids and energy of the body). Systematically providing amino acids as a supplement after training and between meals helps to maintain a positive nitrogen balance and thus helps build muscle mass and strength, and accelerates regeneration processes. Immediate delivery of amino acids after training and maintaining their level is crucial for the regeneration not only in bodybuilding, but also in other sports. In addition, the necessary sterile reduction diet, which often does not provide all the necessary amino acids. They can also be applied with energy deficiency of glycogen, periods of hunger and a restrictive diet in the body (BCAA) and immune (eg. Glutamine). Complement free amino acid in a supplement peptides prolongs the absorption time and the alignment of their level in the blood. These amino acids have a particularly large amount and concentration of the active substances. Anabolic processes lead to the formation and growth of organs and tissues (synthesis) are so connected with the general increase in weight and body size. Catabolic processes cause a reduction in the size and mass of tissues and organs. In these processes, the protein constituting the tissue is broken down to amino acids which can be utilized by the body for other purposes (energy - gluconeogenesis, support the immune system or digestive tract). In a situation of malnutrition, acute stress or excessive exercise may temporarily take up catabolic processes. Therefore, it becomes important issue adequate supply of amino acids. Super Amino 6000 help build muscle mass and accelerate post-workout recovery. Moreover, they are provided with a patented system dymatize timed release of the active ingredient CRT. 2-3 times a day for 3 tab. Składniki: Super Amino Whey-Casein Protein Complex (izolat białek mleka, izolat białek serwatki, koncentrat białek serwatki, kazeina micelarna, kazeina), białko grochu, izolat białka brązowego ryżu, aminokwasy rozgałęzione (l-leucyna, l-izoleucyna, l-walina), l-arginina, l-glutamina, maltodekstryna, kwas stearynowy, celuloza mikrokrystaliczna, kroskarmeloza sodu, węglan wapnia, dwutlenek krzemu, sorbinian potasu (konserwant), kwas cytrynowy, polidekstroza, hydroksypropyl metyloceluloza, średniołańcuchowe trigicerydy, etyloceluloza, chlorowodorek amonu, kwas oleinowy, alginian sodu, lecytyna sojowa. Jak dla mnie świetny wybór, solidne dawki i bezproblemowe tabletki. odczuwam jakby lepszą regeneracje po treningu, kiedy stosuje te aminokwasy. dzieki temu jestem w stanie trenowac czesciej a to przekłada się na efekty. super sprawa!